Country style decorating has been around a long time. My sister introduced it to me many years ago and I still love it today. Country decorating no longer just means stuffed teddy bears and handmade quilts. It really covers a variety of styles from rustic to romantic to modern to shabby chic. 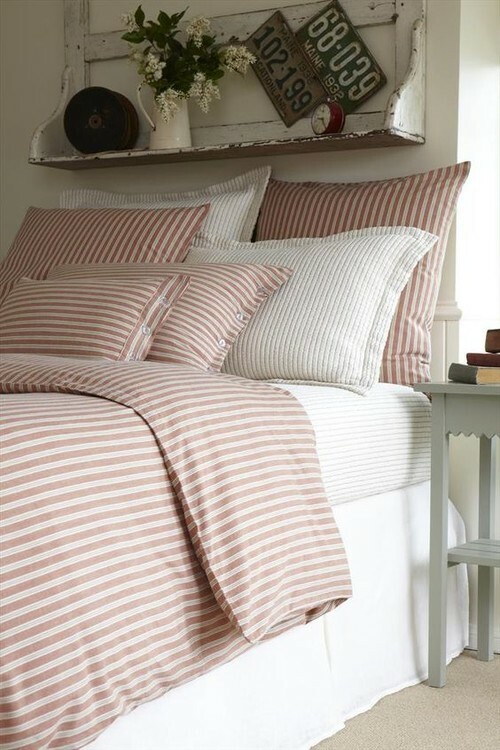 Country style means comfortable, livable, pretty, organic, and cozy. 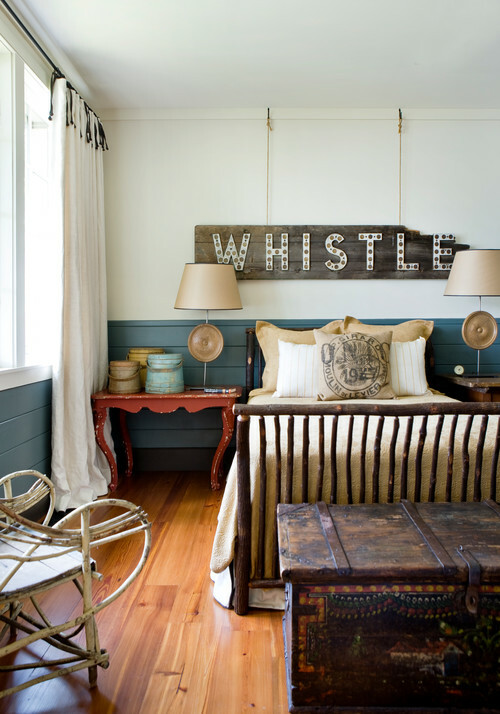 Here’s a collection of rooms that shows the diversity of decorating with a country flair. Slip covered furniture is a sure sign of country comfort. This beautiful living room with warm wood floors and vaulted ceilings might be labeled by some as farmhouse style. In my humble opinion, farmhouse decor can also be categorized as country. But country styling covers a wider variety of home decorating. Soft tones in cream, white, and pink create an elegant country style living room with a pretty chandelier overhead. Mullioned windows with soft sheers, painted siding on the walls, and rustic flooring lend the country touch. Photo by Unique By Design Ltd.
Another feminine living room can also be classified as country. Detailed moldings, a classic mantel filled with rustic logs, and hardwood floors showing a little wear and tear give a nod to country living. Collected vases and a vintage phone add unique character. A warm and cozy stone fireplace will always leave you feeling the comforts of a country home. 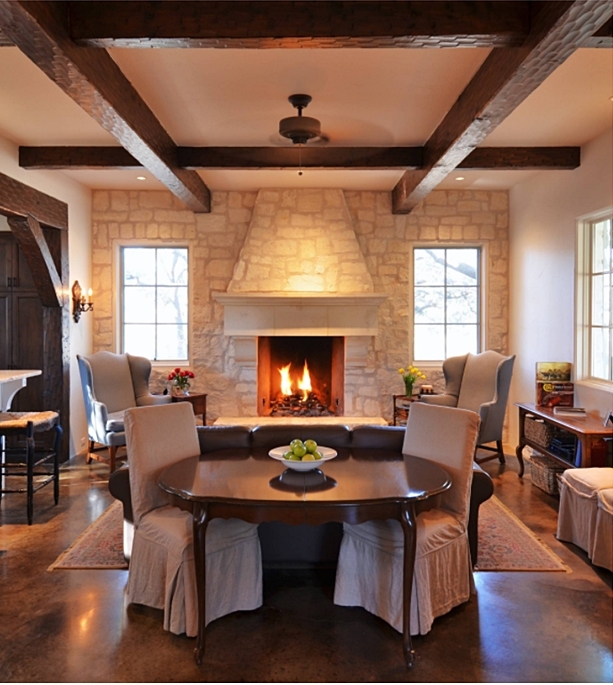 Add rustic ceiling beams classic wing chairs and you’ve got all the makings of a magazine-worthy room. 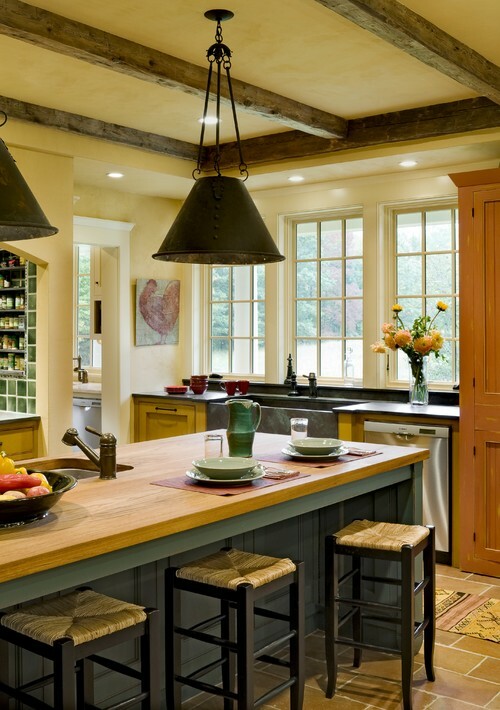 I absolutely adore country style kitchens. I’ve shared kitchens from the UK and kitchens from the US. 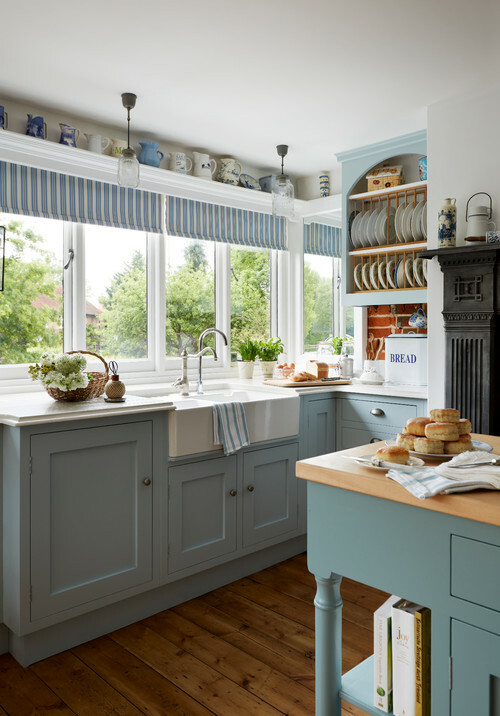 Paint your cabinets blue if you want to add a little bit of country styling to the heart of your home. 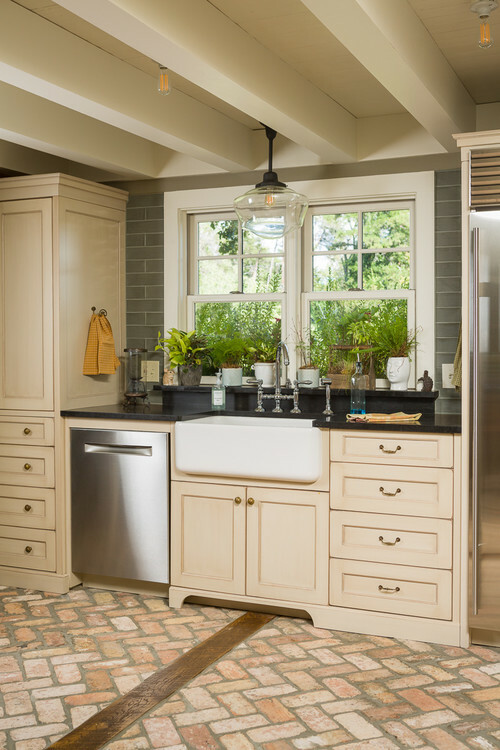 This quaint little kitchen could be called either shabby chic or country style. Light wood tones, polka dot plates, and a striped window shade could also qualify as cottage style, too. Earthy elements create an organic vibe in this country kitchen, from the brick floor to the painted wood beamed ceiling with Edison lights. 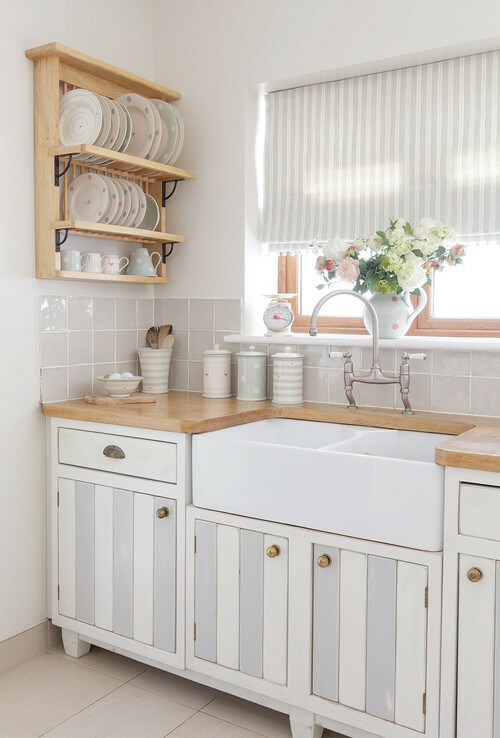 Oh, and let’s not forget that beautiful farmhouse sink! Open shelving always creates a casual style in the kitchen. Add a candle chandelier and the contrast of dark and light, and you’ve got an eye-appealing space. Rustic pendant lights, flowers from the garden, painted cabinets, and a whimsical rooster painting add farmhouse appeal to this gorgeous kitchen. 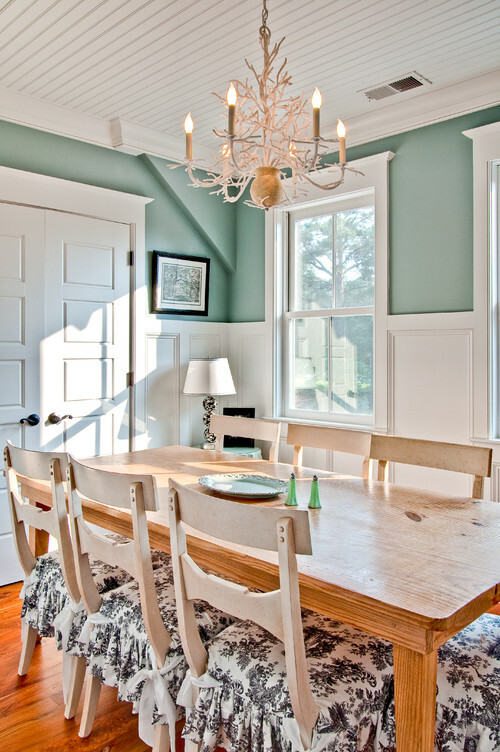 Country dining rooms can be either rustic or slightly elegant. Strong architectural details pair with Swedish style chairs padded with toile seats to create an eclectic country look. 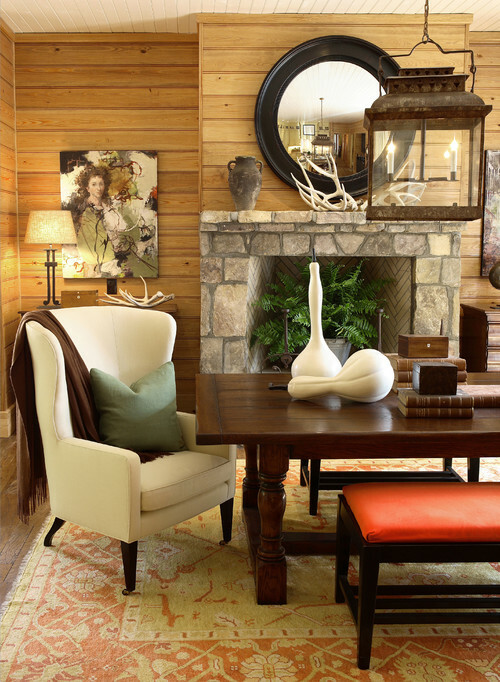 I love the organic warmth of this dining room that puts me in the mood for fall! 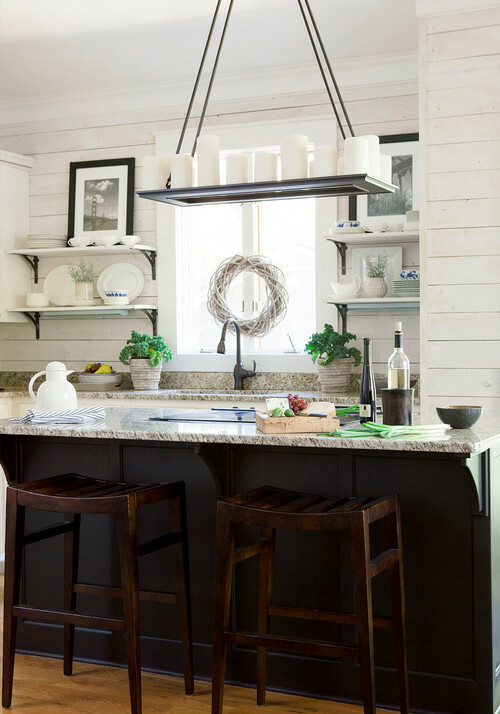 Add country styling to your dining space with metal pendant lights and a rustic wood and metal shelving unit. Rugs on wood floors are another classic country touch. 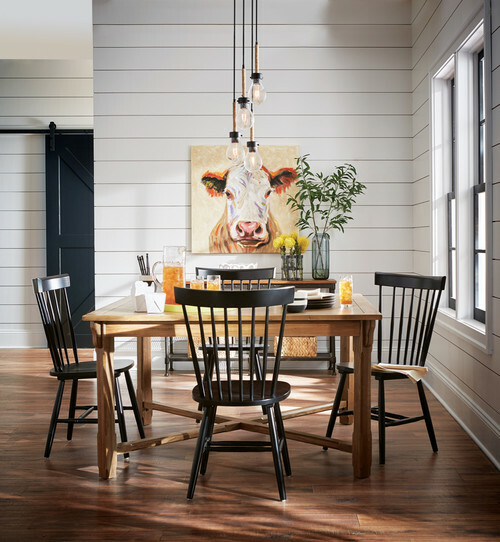 Two things that always say country style are Windsor chairs and cow decor! 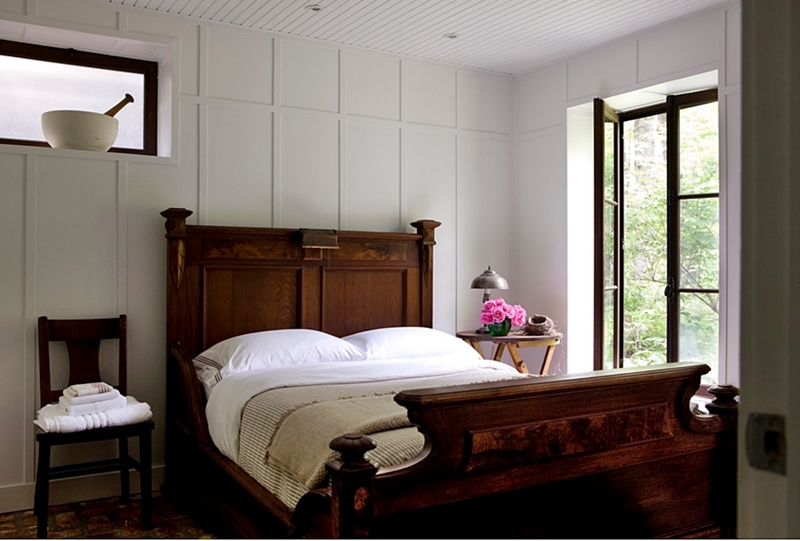 Country style bedrooms are comfortable and filled with textures. 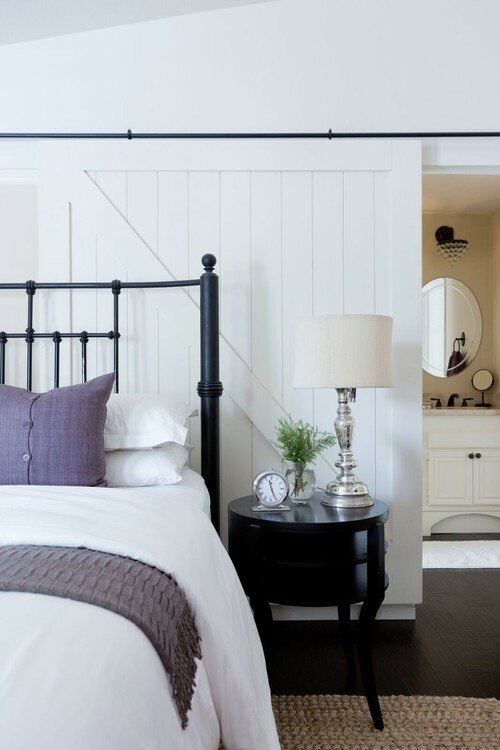 Here you’ll find a sliding barn door paired with a metal bed and a nubby rug underfoot. Purple pillows and a cozy throw add a touch of and unexpected color. Collected finds populate this whimsical bedroom. I think those unique, collected finds are an integral part of the country style. Wood and white always makes me think of country and farmhouse style. The two look classic together in any room. 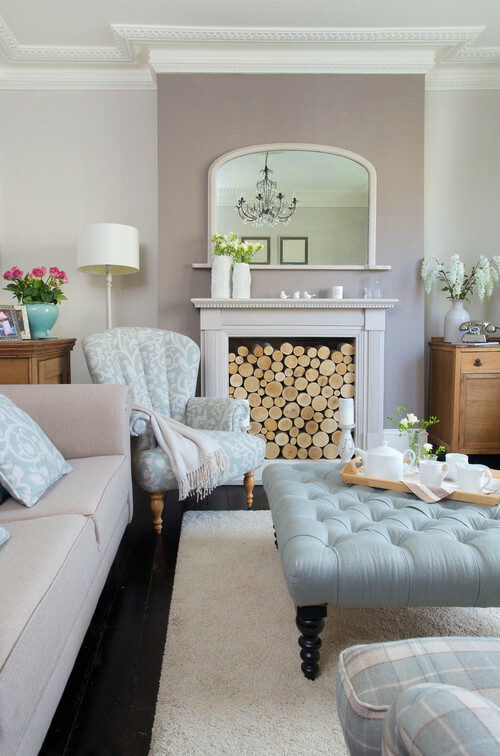 Country style can be interpreted in so many ways and is most likely why it’s still widely popular today! Beautiful rooms and spaces. Thanks, Jennifer! Every time i see country style it reminds me of my cousin and their wonderful farm in the country. The house was big old house with a big sink and wood cook stove. The front of the house was a creek where we swam in the water with the cows, lots of memories. I love country style kitchens. Thanks for all these wonderful examples. I think this could be my favorite blog you have written. Right now I have so many ideas swirling around in my head I am like a dog chasing its tail. I could enjoy living in any of these rooms. I am going to try and adopt an idea or two (or maybe twenty)! Thank you. Beautiful rooms!!! … So much wonderful inspiration here! A very nice collection of beautiful and rooms. I don’t understand crystal chandeliers in farm or country decorating. To me they are the finer decorations for the city folks. WHY do we put slipcovers on a sofa and hand a very large chandelier over head? Contradictions in decorating add interest to a space, move the mind around with a little surprise. Everything goes together that you like.